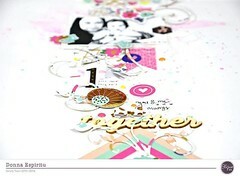 When I first saw the June kit, Aquarelle, I fell in love with the mix of florals and geometric prints! The colors also reminded me so much of my mother, and I had the perfect photo in mind from last mother’s day. Somehow, on Mother’s Day last year, my mom and I ended up making everyone else brunch….we stopped and looked at each other and said, “Wait, why are we doing this?”. I guess it’s just what mom’s do! I started with the pinkish watercolor background paper and added some gesso and mists. Then I layered small squares of patterned papers, 3×4 cards, and vellum from the kit in a loose circle arrangement and stitched a circle with teal thread. Next I cut one of the exclusive cut files for this months kit from white cardstock and layered it over the circle. A few more scattered bits from the die cuts/ephemera pack and a title with the Pinkfresh copper colored alphas to finish the page. Categories: Yearbook | Tags: Audrey Yeager, CKAquarelleKit, Cocoa Vanilla Studio, mixed media | Permalink. I love all the layers and all the bits and pieces you added, just beautiful!! This is so pretty Audrey. Love the stitched circle. Such a pretty layout. I love the stitched circle too!